We have completed our DNS migration to Dynect (http://dyn.com/enterprise-dns/dynect-platform). They are the industrial strength DNS service powering Twitter and bit.ly, and have been incredibly responsive. We’d also like to thank Akamai (http://www.akamai.com/) who were also extremely helpful throughout. Once again, we’re sorry for the problems earlier today and we’re doing everything we can to make sure we’re using the most reliable services available moving forward. We’ll be posting a detailed explanation of the DNS issues later this afternoon. In the meantime, please reach out to us at support@chartbeat.com with any questions or concerns. We’ve completed our migration to the new DNS provider. Traffic levels in the dashboard will begin to get better soon but, because of caching, it will take a while for a complete recovery. We’re sincerely sorry for this problem and we’re here to answer any questions you may have about your site and chartbeat. 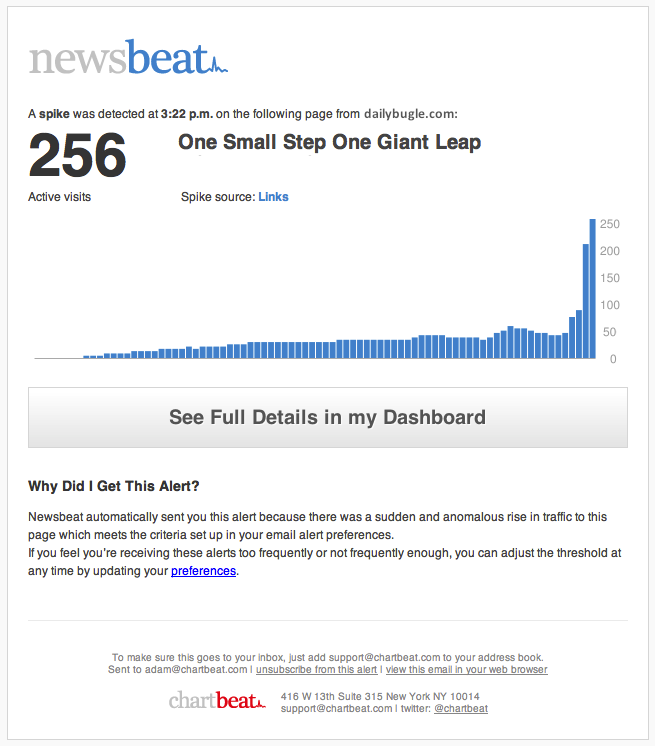 Please send us an email at support@chartbeat.com anytime. We’re in the process of moving to a new DNS provider. As the correct IP address of the nameserver begins to propagate, you will see traffic numbers on your dashboard recover. We will continue to update as we see improvements on our end. We’ve completed the DNS migration and the changes are propagating across the internet. Numbers should return to normal soon. A full post-mortem of the situation is posted here. This doesn’t have any effect on the users visiting your site, but it means that some dashboards will only show a sample of visitors for a little while. We’re working to migrate our DNS records to a new service provider. We’ll send another update shortly. Thank you for your continued patience. We’re really sorry and we’re working as hard as we can to get everyone back to normal.